Butterbur is not easily confused with other wild plants on this web site. 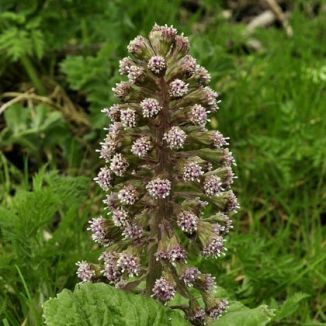 Forming vast patches of vegetation, in wet ground mainly, by rivers and on damp roadsides from March to May, Butterbur is a rather striking perennial. Many, many small pink-red, rayless flowers (8-12 mm) are carried in clusters along upright spikes which reach up to 40 cm high. (In Ireland, the male plant is the wildflower generally found, but in other parts of Europe a female version grows and this has smaller flowers which are carried on separate plants). Arriving a little after the flowers, the large leaves can measure as large as 1 m across and are pale-green and heart-shaped, somewhat like a large version of the leaves of the Winter heliotrope. These have robust hollow stalks and are softly hairy below. Butterbur is a native plant and it belongs to the Asteraceae family. I first recorded this plant in Inistioge, Co Kilkenny in 2009 and photographed it near Lullymore, Co Kildare in 2010. 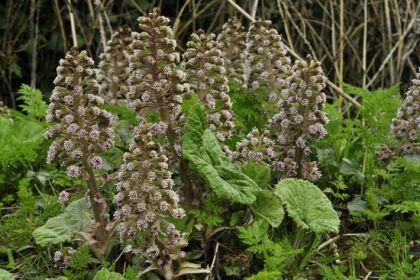 Butterbur got its name from the practice of wrapping freshly churned butter in its great, round leaves. It was also known as 'Plague-flower' as it was said to contain remedial properties said to assist at the time of that pestilence.